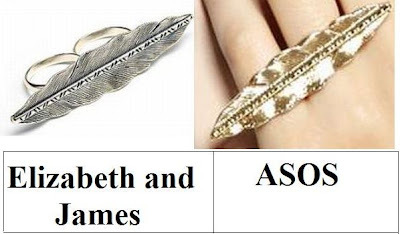 My loves, to your left please savor the stunning style that is the Elizabeth and James Feather Across the Hand Ring – the very same one seen decorating the dainty digits of one Ms. Mary-Kate Olsen; to your right allow your eyes to fall upon ASOS’ Double Finger Metal Feather Ring. While the ambrosial ASOS piece is available only in gold, as opposed to the burnished silver hue of the Elizabeth and James original; for just $13.79, in comparison to the $150.00 price tag of the Elizabeth and James gem, it provides one’s accessory drawer with a splash of high fashion frippery – on a frugalista’s budget! I gotta say the Elizabeth and James one is amazing! As in, real amazing. I think it's ok to splurge on this one? I seriously hate the idea of having two fingers stuck together BUT knowing that Mary Kate has one makes mee think I should also. I love her style! I haven't seen these before, what an interesting look. I'd buy the less expensive one, to try out the look and feel first. Oh I love the E&J one! I really like these. I haven't ever tried one on, and have always wondered if I could handle having my fingers bound together, but man are they pretty. This leaf especially! Unexpected but cool. I prefer the more subtle glow of the Elizabeth and James ring though! This is so pretty. I love it for this time of year. I so thank you reading my work. I do so appreciate it. I'm about to embark on a 30 day novel exercise..and decided to do it with my "derrick" character. Hopefully, he'll be an interesting character to work with. I hope, anyway.. So the best way I can keep up with it..is to possibly start it in a blog. It'll mainly be for my purpose..but just one more blog to add..I suppose. I'm excited yet uneasy. I have my doubts I can write that many words at Nanonovel. But thats not really going to be on my mind. Just the characters. I actually prefer the asos one, I might have to treat myself! Just because of the sheer fact that I need something from Elizabeth and James, I would definitely get that ring. Happy Halloween, Erika. Oooooh another fab find, darling! I actually like the gold ASOS one better. Gold is more a bit more Fall maybe.. I just like it better. And for 14 bucks, it is def in my budget! Great find! I would totally go for the steal -- and use the savings to buy some more clothes! I love Elizabeth and James,but I have to save on this one! I love the gold one! Oh, I DO love all things Elizabeth and James, but I think that I must save on this pretty piece! I love the gold one! I think it is so much prettier not to mention cheaper. spendthrift! i love the elizabeth and james one! I have got to get my hands on one of these rings... literally. All of my coworkers wear them! They are gorgeous! Honestly, I had never seen anything quite like this. Way cool. And I love that cheaper priced version too. Very pretty, and great for this time of year. Cool price too! What a cool ring. I wonder how long I could wear something like that. Maybe I should try at that cool cheap price option. The Elizabeth and James one is so much prettier IMO... perhaps its just the photogrpah, but the detail is far more stunning! I have the E&J one.. I love it so much!! Haven't yet tried a connector ring yet but if I do I'll wait for a silver version of ASOS's ring. I'm not too keen on the shiny gold version. Ahh, such a toughie! The $13.79 pricetag is calling my name, but I've always been more partial to silver than gold, so I guess I'd have to be the spendthrift! Unusual for me to go for the more expensive one but I prefer the silver one. I always think you get your moneys worth with jewellery. Awesome! both are looking preety but I don't like finger ring too long, I will love to buy something different that. I do love statement rings, and both are so pretty. I think I may have to choose ASOS. I prefer the asos version! I really want a two-finger ring. I would have to be saving. Hope you had a great weekend. Take care. Sighh I love them both but the Elizabeth and James version is just perfect! Nice- ASOS has so much good stuff. i think i've seen this ring at F21 for abour $6. it's very popular. Great find! Love this ring. I'd go for the ASOS version, but only because I like the idea of a gold finger ring. I'd feel like Slick Rick and other 80's rappers. REALLY love the rings !!! HAVE TO HAVE THEM !!! Two fingered rings are all the rage. Closet Deep absolutely loves them. We've seen them all over Hollywood on stars like Nicole Richie and AnnaLynne McCord. Love it! I'm pretty sure I've seen that at Forever 21, too! Cute look; I don't really like gold jewelry, though. ooh so love this ring! I would go for the E&J piece though only b/c I have one of their necklaces & I adore it! I think the E&J ring has me this time! that is a CUUUTE ring! Elizabeth. It just looks more realistic, and much more delicate (in a good way). While the education projects are for the most run first, the certain institutions are addition of an constructed power: each arms provide with at least two short rows.